Is Monetary Policy The Best Answer To Control Inflation | Business Article | MBA Skool-Study.Learn.Share. What is the one concept in economics that leads to growth of the country but at the same time its excess is detrimental to it? What has made the RBI officials sweat for the past two years? What has India been trying to keep under 2 digits relentlessly?? No awards for guessing- Inflation. India’s inflation on Sept 29th 2011 was reported to be above 9% which is well above the RBI could digest. Post the 2008 financial crisis India recovered sooner than other emerging economies, but inflation caught up with India much sooner than other countries. Inflation which was negative for a brief period in 2009, started increasing from Oct 2009 and has sustained itself at 9-10 percent since Jan 2010 pointing to the supply and demand pressures. 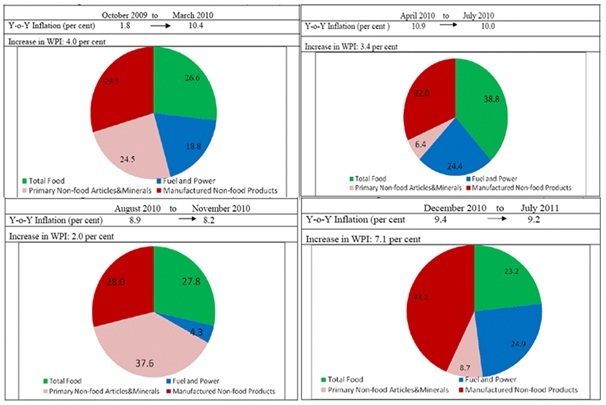 The WPI (Wholesale Price Index) Inflation rose from 1.8% in Oct 2009 to 10.4% in March 2010 indicating the huge surge in food prices due to less rainfall during 2009-2010. Moreover in the late 2009, the world was recovering from the trough in global commodity prices. From April 2010 to July 2010 the Y-o-Y inflation remained at 10% and the WPI Inflation increased by 3.4%. Major driver of inflation in this period was food majorly protein rich items like milk, eggs and meat which are not dependent on monsoon. Inflation slowed down during the period between Aug 2010 to Nov 2010. Between Dec 2010 and July 2010 the moderately declining inflation rate changed its course suddenly with Y-o-Y inflation changing from 9.4% to 9.2% and increase in WPI by 7.1%. This was on account of food inflation as unseasonal rains caused damage to output of vegetables in various parts of the country. Though it seems that inflation was caused mainly due to food inflation there was simultaneous sharp increase in fuel and commodities prices which accentuated domestic inflationary pressures. Why do we need to worry about Inflation? It leads to socio economic costs, since inflation poses a greater burden on the poor, sustained inflation leads to unbalanced progress. High inflation leads to uncertainty causing the diversion of resources from productive investments to speculative activities. Since people maintain the consumption of goods that they were consuming before though they are high priced, it reduces the household savings. It leads to Inflation risk premium due to which the nominal interest rates tend to be higher. If the domestic inflation remains higher than other trading partners then it leads to the appreciation of the exchange rate and thus affects external competitiveness. Continued inflation has adverse effects on the overall growth. Therefore, RBI has set the threshold level of inflation as 4-6 percent. How does the RBI control inflation? Increase the repo rate, which is the rate at which RBI lends to other banks. This allows RBI to make money costlier and by decreasing the repo rate it makes money cheaper, thus contraction or expansion in money supply is done to deal with inflation. Increase the reverse repo rate, which is the rate at which other banks give loan to RBI. If RBI wants to reduce liquidity then it increases this rate. These steps taken by the RBI form the core of Monetary policy. In view of the current steady growth in Inflation in the country, the RBI has parallely activated the monetary policy at each stage. Since March 2010, the repo rate has been increased by 350 bp. This is the 12th time that a rate hike has happened because the RBI has taken small steps of increasing the repo rates by 25 basis points each time. Firstly there is a point of view that monetary policy has been too ‘hawkish’. It says that India’s inflation has mainly been driven by supply shocks and monetary policy should not respond to such type of inflation. Secondly there is another view that RBI monetary policy has been soft on inflation. RBI has taken baby steps of 25bp each point which were not effective enough to control inflation and its persistence is majorly a cause of RBIs delayed response. The arguments above are contradictory one saying that the action shouldn’t have been taken at all and the other saying the action should have been faster. There is also an atmosphere of mistrust being created around the friction between RBI and Finance Ministry. It has been a common observation that RBI responds to inflation by a tight monetary policy and increasing CRR and interest rates to contract the money supply and soon the Finance Ministry announces the decision to provide massive capital to banks to increase their liquidity and hence they could lend much more to the market! Whose decision should the common man trust, the babus or the netas? We observe a trend of a vicious circle of never ending rising prices. The common man suddenly becomes poorer due to the high interest rates thrust upon him. A consumer becomes poorer as his obligation of EMI increases and his savings get reduced, a businessman’s profit margin reduces by increasing his cost of operations and in order to maintain the same profit margins he increases prices which eventually increases the inflation index. Well, there can be justifications for each of the arguments against RBI. The first argument can be countered in the following way. It is said that monetary policy need not react to supply shocks, but it is based on two assumptions: a) Supply shocks are purely temporary b) Only supply shocks are driving inflation. But sometimes supply shocks are not temporary and can lead to a permanent steady increase in prices. An example of this is the International crude oil prices which had an annual average increase of 17 percent in 2000s in contrast to just 2% in 1990s. Also, at times supply shocks are not the only ones driving inflation. An example of this is the increase in global commodity prices which coincided with increasing demand in India. Rising incomes lead to shift in demand of cereals to protein based diet which lead to inflation as mentioned in the earlier portion of the article. Thus it is seen that inflation faced by India has been a combination of supply and demand pressures and not just supply shocks alone. The second argument can be countered by observing the inflationary situation facing the country. There were changing drivers of inflation which have been mentioned earlier in the article. Due to this the monetary policy was adjusted to control that particular driver of inflation troubling the country at that particular point of time. Also the tightening was done gradually to allow the private sector and banks to adjust to the high interest rate environment. But still the argument continues whether monetary policy is the only way to answer inflation. We feel that while the monetary policy does help in controlling inflation to an extent, why not try to take a holistic view of the problems in various sectors facing the country and approach it from a proactive action than a reactive action. Each sectors problem should be dealt head on so as to ease out the demand supply pressures on them. Agriculture sector is the one most prone to problems in todays times. Farmers need to be given the latest equipments and knowledge to increase their productivity and profitability. They should be encouraged to become globally competitive by providing them with schemes to merge their land holdings. Moreover steps should be taken to decontrol sugar, foodgrains etc which would help to remove the black market business that prospers in government schemes. An example of this is the growth of cement only after decontrol. Also there is an acute need of replacing bureaucracy with professionalism to do away with corruption that is plaguing the public sector. This corruption leads to stocking of supplies in a few hands leading to supply shocks. What follows is a reduction of red tape which slows business activities and thus leads to increase in turnaround time and hence costs. Similarly there are many issues that should be taken view of jointly by the public and private sector and work towards improving those that lead to country’s stunted growth through imbalance in supply demand pressures. We thus reiterate, Monetary policy is reactive which controls inflation, why not take proactive steps to wipe off the drivers of limitless inflation?